The Alliance Party is under political attack from unionists and under physical attack from loyalists. But while the explosion of fury directed at Northern Ireland’s cross-community party this week has shocked public opinion, The Detail’s Steven McCaffery reveals that it’s the culmination of a trend that has been building for years. THE Alliance Party says enough is enough. Over a violent 48 hours it has seen one of its representatives forced from her house, others attacked in their home, the shutters brought-down at a string of its offices, and a party advice centre gutted by arsonists. On the face of it, the rampage is linked to loyalist anger over restrictions placed on flying the Union flag from Belfast City Hall. But Alliance now says this crisis follows ten years of intense unionist political campaigning aimed at stifling the liberal party’s growing appeal – as well as loyalist paramilitary intimidation that Alliance has previously played down. Alliance was repeatedly targeted by both loyalists and republicans during the Troubles, but Long and her party leader David Ford say the current upsurge in intimidation has built-up over the last ten years – against a background of unionist political rhetoric. In 2002 Alliance votes helped Sinn Féin’s Alex Maskey become the first republican mayor of Belfast. The development was inevitable after Sinn Féin became the largest party on the council benches, but one senior unionist infamously dubbed a prominent Alliance representative a ‘Provo’ for backing Maskey’s installation as First Citizen. Now Alliance says that while it was publicly castigated by unionist politicians, the controversy saw the party suffer private intimidation from loyalists: In the aftermath of Maskey’s election, Alliance members were repeatedly harrassed, with one recounting abusive and threatening phone calls to their home. The party says a further Alliance representative in Belfast was forced to leave their home as a result of the loyalist threats of 2002. Over the last decade the party says it has been the target of a number of large-scale leafleting campaigns in loyalist areas, which Alliance claims misrepresented party policy over sensitive issues, including the flying of the Armed Forces flag at City Hall. Alliance says its members in East Belfast came under major political pressure during the 2010 General Election campaign, and believes both the DUP and Ulster Unionists have stepped up their political activity against Alliance since Naomi Long’s shock win. The DUP and UUP distributed 40,000 leaflets ahead of the Belfast City Council flag vote. Nationalist parties and Alliance argue the flag reform is the inevitable outworking of Equality Commission rulings, and legal advice, as well as demographic changes that have seen a growth in the city’s nationalist population. 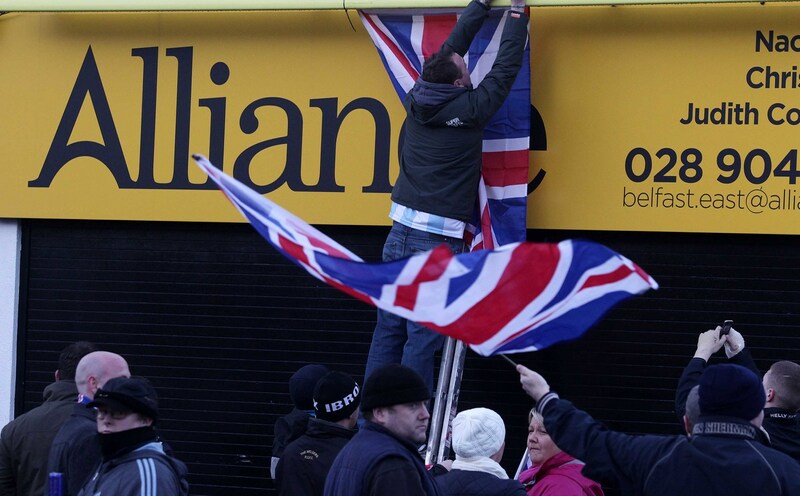 But the controversial leaflet, printed in the Alliance party’s trademark yellow livery, claimed the party was backing what were described as demands from Sinn Féin and the SDLP for the flag to be “ripped down on all but a few days”. In the wake of the latest violence, senior unionists have spoken out. The DUP’s Sammy Wilson rejected any suggestion his party carried some responsibility for the trouble. He defended his party’s political campaigning as being central to the democratic process and he said a string of his colleagues had condemned the violence and called for it to end. Both unionist parties say they urged the public to “make their voice heard” on the flag issue, but did not call people onto the streets, and had urged restraint in their leaflet. But the ugly scenes are a PR disaster for Northern Ireland – sending damaging images of violence to the outside world – as rioters stormed City Hall, and shoppers fled ‘new Belfast’. Belfast councillors were sharing a Christmas dinner inside City Hall around the time that protesters started to gather at the landmark building. Unionists and republicans attended the meal. There were Christmas crackers on the tables. But any seasonal goodwill didn’t last long. The political rows that played-out minutes later in the debating chamber were heated – but arguably lacked the fireworks that might have been expected. DUP and UUP representatives repeatedly criticised the Alliance, and hit out at Sinn Féin councillors, accusing them of seeking to strip-away British emblems. :: Alliance, holding the balance of power in a council which for the first time does not have a unionist majority, complained of “aggressive tactics” from republicans, and of suffering “shabby campaigns” from the DUP. :: Ulster Unionists, who once dominated City Hall, said this was the “worst council” they could remember, “a horrible place to be”, accusing Sinn Féin of installing “hardliners” bent on eroding British culture. :: Nationalists and republicans said Belfast was changing – with their growing community desiring greater recognition and respect. “This is 2012, not 1912’” said Sinn Féin, accusing unionists of hankering after the old days. :: DUP councillors repeatedly referred to claims by party leader Peter Robinson that a growing number of Catholics support the Union. One argued it was “base sectarianism” to assume all Catholics were nationalists, another said his party wanted “a shared society, a shared society within the Union”. After the crucial votes were cast, the DUP introduced a surprise proposal – if the flag couldn’t fly all year from the City Hall building, perhaps one should fly permanently at the war memorial in its grounds. The move appeared to wrong-foot Alliance and the issue was sent to a council committee for consideration – presenting DUP members with the prospect of having successfully blamed their political foes for the loss of one flag, while securing the possible erection of another. Until that moment it had been possible for each party to end the meeting having secured some political gain – the DUP blaming Alliance for the flag reform, but nationalists securing an historic compromise with the same centre-ground party – but the outbreak of violence trumped all other considerations. If unionists hoped the story of the night would be politically embarrassing to Alliance, their plans unravelled. There was immediate confusion in the chamber. The Lord Mayor Gavin Robinson – tipped as the DUP’s next Westminster candidate in east Belfast – appeared initially uncertain of what to do. He was not the only one caught by surprise, but the sound of an angry mob at the City Hall’s back door, and the sudden scream of the building’s alarm, forced the council session to be halted. The action then moved downstairs, where there was broken glass, and the sight of people nursing injuries, before shouted warnings that the crowd was making a second attempt to enter the building. Then came the arrival of riot police with barking dogs, hurrying past City Hall’s twinkling Christmas tree to face the angry mob outside. Later, riots raged on the road that runs past the rear gates of the City Hall complex. Loyalists threw fireworks at police, and attacked armoured Land Rovers with weapons including bricks, golf balls, crash barriers and an iron bar. The police faced criticisms over the initially low level of security at the event – especially since a similar protest boiled-over last year after the then Sinn Féin mayor failed to present a prize to a British army cadet. In the immediate aftermath of the flag riot, police statements noted the presence of “women, children, buggies and wheelchairs” among the protest, and said they had no intelligence of a major threat. But republicans cited the role of social media in attracting large numbers, and how online comments signalled an ugly mood. Sinn Féin also said members of the loyalist paramilitary UVF were visible in the crowd. Representatives of the UVF-linked Progressive Unionist Party at City Council said removing the flag was “too much too soon”. They also claimed loyalist confidence was being hit, and anger stirred, by a string of other issues including the Parades Commission, the ‘demonising’ of loyalist flute bands, investigations into the Troubles by the Police Historical Enquiries Team, and the promotion of the Irish language. As police reinforcements at City Hall quelled the riot, a large section of the crowd moved into loyalist areas of East Belfast. There were further attacks on police, and along the route, loyalists hurled bricks at St Matthew’s Catholic church in the nationalist enclave of Short Strand. The attack did not cause damage because police in armoured vehicles swiftly forced the mob away from the scene. The violence at City Hall, however, left 18 people injured. Sinn Féin’s Gerry Kelly was the subject of a death threat. And the scenes dealt another serious blow to Belfast’s image. Since then one Alliance representative was advised to avoid her Belfast home as a precaution, while a number of the party’s offices, including that of Naomi Long, were forced to close following protests in at least five towns and cities. Last night there was a further escalation when an Alliance office in Carrickfergus, Co Antrim, was destroyed by fire; an arson attack on party premises linked to Alliance government minister Stephen Farry in Bangor, Co Down, was prevented by police; and in the same town, a couple who are Alliance councillors saw their home attacked as their infant child slept inside. Stewart Dickson, 62 this Saturday, has been a councillor in Carrickfergus for 32 years. 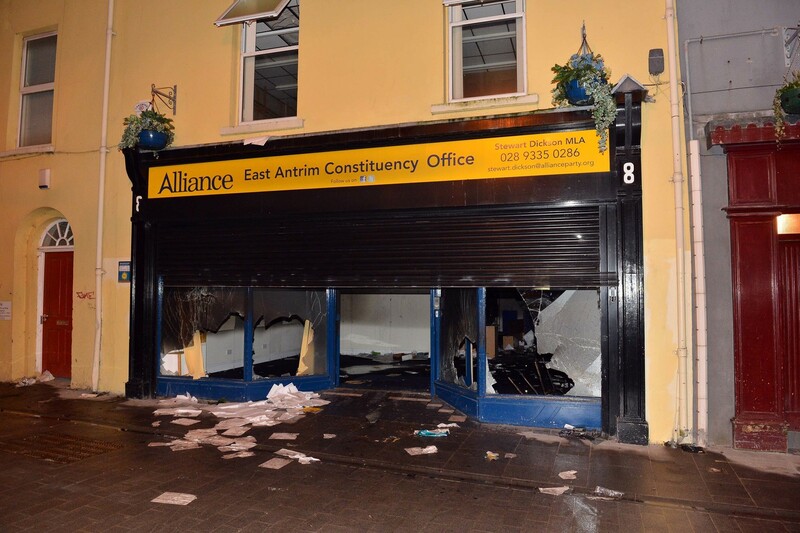 Last night the Alliance representative was staring into the smouldering shell of his constituency office in the Co Antrim town after it was trashed and set alight by arsonists. 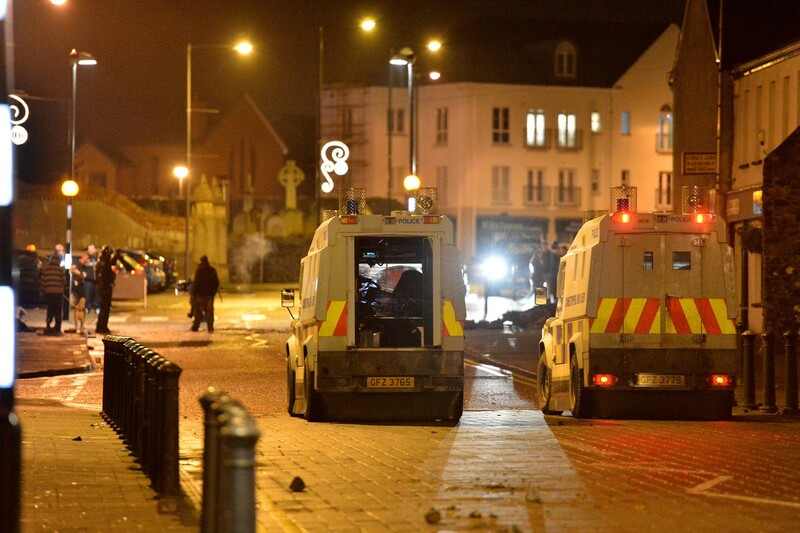 The attack followed a 1500-strong loyalist protest in Carrickfergus over the flag row. Rioting in the town led police to fire baton rounds. But the blaze brings back particularly horrific memories for the Alliance man. “This is not the first time something like this has happened,” he says. Twelve years ago he spoke-out after sectarian slogans were daubed on the homes of Catholic families. But he paid a heavy price for his intervention. He was at home with his wife when loyalists armed with sledgehammers broke in. The intruders smashed all the windows in the building. They pounded the couple’s belongings into the ground. Two cars parked outside suffered so much damage they had to be written-off. After the fresh attack on his office, he says: "This brings back painful memories. It brings it all back. “And it would leave you looking over your shoulder. He maintains mainstream unionist parties have questions to answer. If Alliance has taken a battering this week, the political fallout has left unionists fighting for the moral ground, fending-off suggestions that their explanations for loyalist anger risk being read as providing a rationale for the violence. The leaderships of both the DUP and the Ulster Unionists have condemned outright the attacks on Alliance and all the violence associated with the protests. The two unionist parties characterised their own political campaigns against the party as entirely proper and aimed at raising legitimate concerns held by their voters. But Mr Ford said unionist political tactics had fuelled tensions in loyalist communities, which were now being taken-out on his party. Unionists have blamed nationalists and the Alliance for opening-up the “Pandora’s box” of flag policy, but the DUP in particular has been on the defensive since the storming of City Hall, despite repeated condemnation of the violence from both Ulster Unionist leader Mike Nesbitt and DUP leader Peter Robinson. After a century spent fluttering from Belfast City Hall’s famous dome, the Union flag is to be reduced to appearing on 20 designated days per year – representing a significant break with long-held custom after unionists were out-voted. It is part of the outworking of political and demographic changes in Northern Ireland, but raises further questions about how republicans, but in particular unionists and loyalists, will cope with the likely prospect of years of further reform. 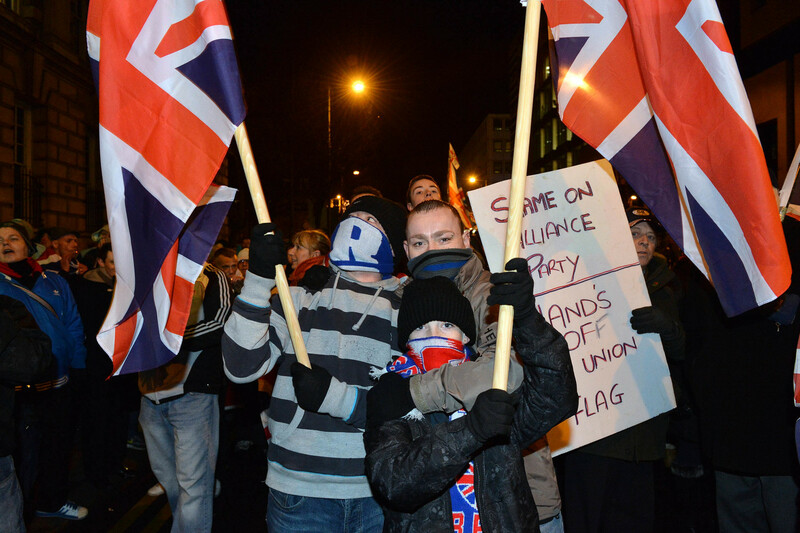 It is claimed that loyalists are planning to stage a protest at Belfast City Hall in coming days. Organisers may not get the numbers to mount a significant event, but it is understood security chiefs are sufficiently concerned to have asked community leaders to lobby against any such plans, especially since large numbers of Christmas shoppers would be in the area. There are some hopes among Alliance ranks that shock at the Carrickfergus arson attack could draw the sting out of the protests and see them dwindle. There is also the imminent arrival in Belfast of Hillary Clinton – and unionist leaders will not want to spend their ‘face time’ with the US Secretary explaining the furore over flags. Behind the turbulent events of this week, the big picture is one of unionist efforts to win over the political middle ground, while holding on to its traditional support. Alliance enjoyed political gains in the General Election of 2010, and in the local government and Assembly contests that followed. While its growth has chipped away at Ulster Unionist and SDLP support, Alliance stands on the centre-ground that Mr Robinson hopes his party can share. The DUP needs to encourage potential voters in loyalist areas to turn-out at election time – but strident politics risks alienating the liberal unionists the party desperately wants to woo. The Detail previously reported here how in November Peter Robinson told his party conference that a growing number of Catholics could be persuaded to accept the Union. He effectively asked the DUP faithful to consider further concessions as the price for sealing the deal. But that seems a distant prospect after the events of this week. Are London and Dublin flagging?